The course is 15 hours of lessons a week. Leading to the Cambridge Certificate in Advanced English, this course teaches and practises English in the context of the five exam papers: Reading, Writing, Use of English, Listening and Speaking. It is for students who are preparing for the Cambridge Certificate in Advanced English (CAE) examination. This course is for adult students who are at an upper–intermediate to advanced level, and who now wish to focus on increasing their accuracy and general competence in English and to prepare for an externally validated examination – the Cambridge Certificate in Advanced English. understand English spoken by native speakers at natural speed and answer questions as required by the examination. Cambridge ESOL are the world’s leading range of certificates for learners of English. Each year, they are taken by over 1.75 million people, in 135 countries and are widely recognised for work and study purposes. The exams are linked to the Common European Framework, published by the Council of Europe. Cambridge ESOL provides a Special Arrangements service, for example for candidates with learning difficulties, hearing difficulties or visual difficulties. 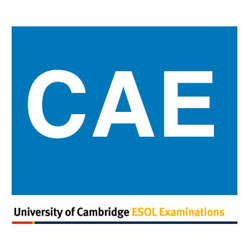 Cambridge ESOL exams are: FCE and BEC amongst others.